Plot Summary: The eponymous Megumi was a normal Japanese 13 year old from a loving family who was kidnapped by North Korean agents in 1977. 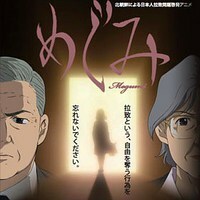 This documentary anime covers Megumi's childhood and abduction before shifting to her parents efforts to get answers and to prompt the Japanese government to take action (something they were reluctant to despite having had more than a dozen citizens kidnapped by North Korea in the 1970s and 1980s). Animation Production: Trans Arts Co.